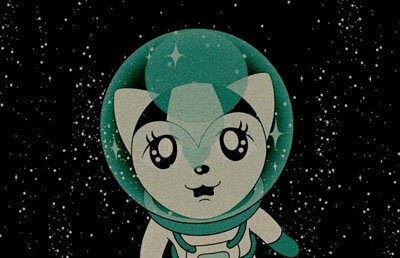 ‘TAMALA 2010 A Punk Cat In Space’ is a Japanese animated feature film created by the Trees of Life (T.o.l.) team. 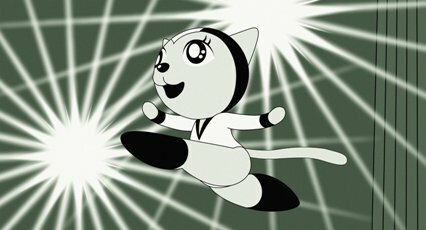 A mainly black and white film, computer animated in both 2D and 3D, its a fascinating but flawed film, with mood seeming to take precedence over any coherence. The film has never (as yet) been released in English speaking territories, though the Japanese DVD release does have English subtitles (and at least that way you can be as confused by the dialogue as no doubt the Japanese were). The Tamala character was envisioned as a star in the making, with ‘A Punk Cat in Space’ just being the first of a trilogy of movies, as well as associated TV series and other media. So far there have been 2 short animates pieces ‘Tamala on Parade’ ‘Tamala’s Wild Party’ which appear on one Japanese DVD, ‘Tamala on Parade’. Tamala lives in Meguro City, Tokyo, on ‘Cat Earth’, a world of Big Business and rampant commercialism, where space ships litter the skyline, the ‘Catty & Co’ corporation are omnipresent and a giant mechanical Colonel Sanders strides the streets with an axe embedded in its head (visible over the rooftops) repeating an advertisement for meat over a loudspeaker, like a mantra. Tamala, who we see playing ‘Space Invaders’ type video games, is bored with the city, so leaves her human foster mother and boards a spaceship bound for her birthplace, Orion. However, her ship is shot down and she lands on Planet Q in Hate City. The contrast between the clean and bright ‘Cat Earth’ to the dark and seedy ‘Planet Q’ could not be more distinct. It is in Hate City that she meets a male cat, Michelangelo, who becomes her boyfriend. Planet Q is a place where dogs rule and the couple are pursued by Kentauros, a sadistic dog dressed as a motorcycle cop. Further on, Tamala uncovers not only the secrets behind the powerful ‘Catty & Company’, but also her own identity. There is a lot more than that besides (including the voice acting of Beatrice Dalle). A lot of random events and off-kilter scenes.